Lionel Andrés Messi (born 24 June 1987) is an Argentine footballer who currently plays for FC Barcelona and the Argentina national team. Lionel Messi started playing football at a very early age in his hometown’s Newell’s Old Boys. From the age of 11, he suffered from a hormone deficiency and as Lionel’s parents were unable to pay for the treatment in Argentina, they decided to move to Barcelona, Spain. With several first team players seriously injured, the services of several reserve team players were called upon, and Messi became a regular feature of Barça squads. On May 1, 2005, he became the youngest player ever to score a league goal for FC Barcelona – against Albacete when Messi was only 17 years, 10 months and 7 days old. Lionel Messi wearing FC Barcelona`s colorsIn June 2005 he starred for the Argentina U-20 team that won the Football World Youth Championship played in The Netherlands. Messi picked up the Golden Boot as top scorer with 6 goals, and the Golden Ball for the best player of the tournament. Despite his youth, Lionel has already drawn comparisons with Diego Maradona, arguably the best football player of all time. On September 25, 2005 Messi obtained a Spanish citizenship and was finally able to make his debut in this season`s Spanish First Division. He had previously been unable to play because FC Barcelona had filled up all of their quota of non-EU players. Messi built on his international reputation in the 2005/2006 season for Barcelona and earned himself rave reviews, most notably from Argentine superstar Diego Maradona who said that Messi was “Maradona’s successor”. Lofty praise indeed for a player barely 18 years of age. 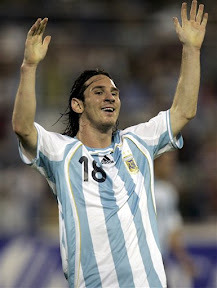 A thigh injury late in the 2005/2006 season almost ruined Messi’s chances of representing Argentina at the 2006 World Cup in Germany but coach Jose Pekerman took a chance on him and he made several substitute appearances culminating in becoming the youngest player ever to represent Argentina at a World Cup and even bagging a goal in the 6-0 victory over Serbia and Montenegro.